Making homemade sausage was on my bucket list for a long time! I’m a big fan of cooking from scratch. It learns you how things are made and makes you understand the craftmanship behind what you’re eating. 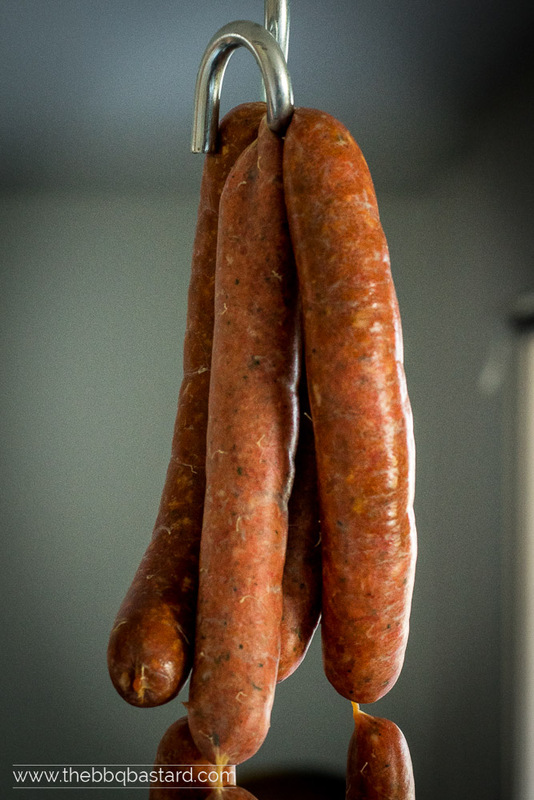 By making sausages like this homemade chorizo I found out what’s making chorizo taste great. This and a post by Therese from “Kitchenexile” inspired me for making the chorizo style pulled pork a while ago. 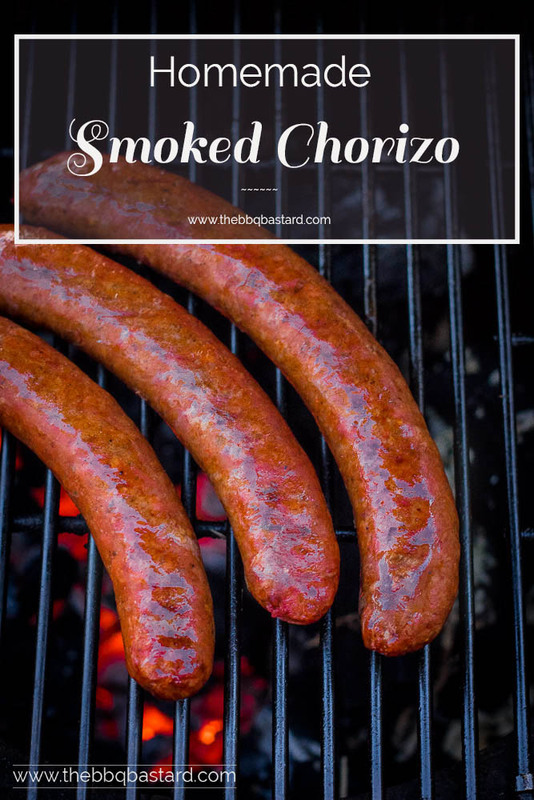 Now it’s time to share the recipe for the actual homemade chorizo sausages. I have to admit I was a bit hesitating to make my own sausages. It sounds like a huge adventure with a lot of possibilities to fail during the process. That’s why it took me a while before I dared to use my sausage tube. 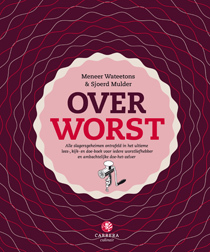 I thouroughly informed myself by reading the book “Over Worst” by “Meneer Wateetons”. It’s a pitty the book is only written in dutch since it’s a thourough guide into making homemade sausage. 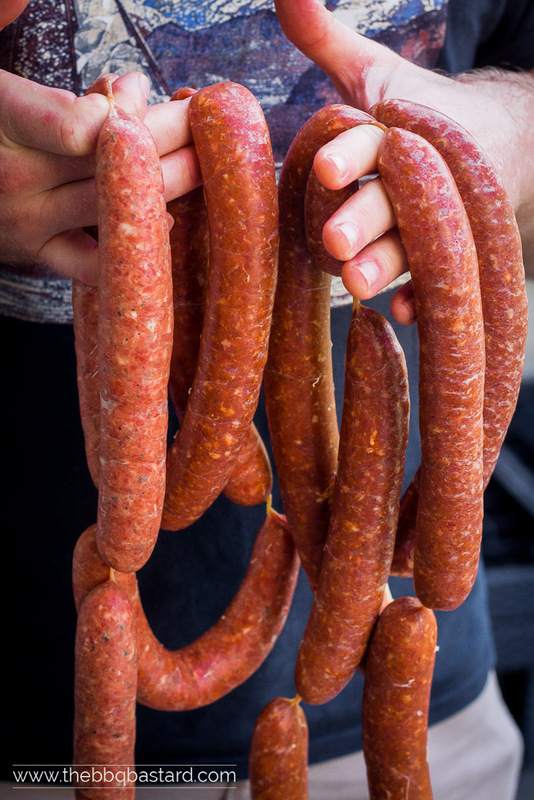 Besides a lot of different recipes there’s information on every aspect of making sausage, ranging from curing, smoking … to even dry aging the sausage. Besides some lame page filling jokes there’s a load of interesting information. It explains how to work safe and efficient. So if you understand some dutch it’s a good book to start with. When making sausage you need to use some meat rich in fat and coarsely ground. You can ask your butcher or make your own minced meat. When making your own mince you freeze meat dices from about 2cm. for an hour. Grind the meat with the largest blade (8mm.) when it’s ice cold. Add the spices and thouroghly knead the spiced meat until it’s feeling sticky. Add the meat to your sausage stuffing kit (I use the Kenwood attachment kit) with the large tube covered with pork casings you thouroughly rinsed for a half hour. Carefully lead the mince in the casing until it’s gently stretching. Don’t add to much meat, but make sure there are no air bubbles either. If you manage to do it right you’ll end up with nice firm sausages. Let them dry for a couple of hours before smoking them. Chorizo is traditionally made with coarse ground fat pork meat and spiced with smoked paprika powder, garlic, red wine and some green herbs. That gives them their typical flavor profile and colour. Over here in Belgium the dried Chorizo is most known but it’s often sold fresh too (mostly in Mexico I’ve heard). 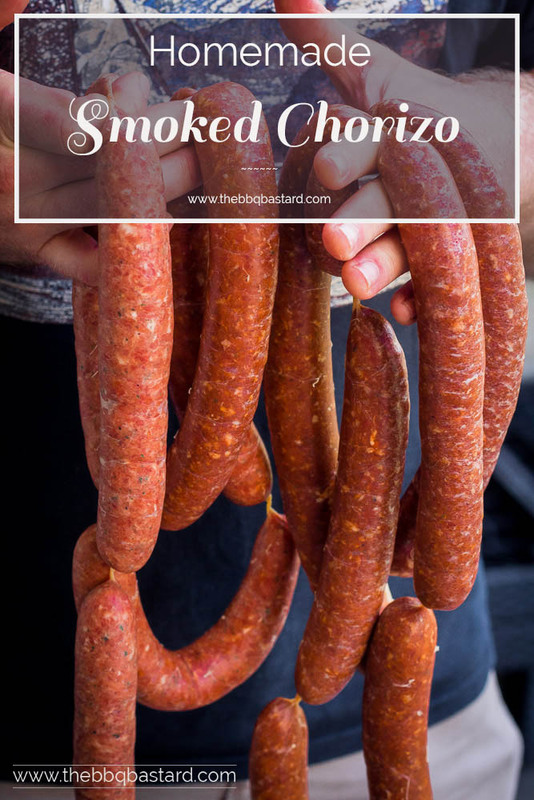 Since I’m hesitating on drying sausages myself I opt for fresh smoked homemade chorizo. If someone can convince me it’s safe to dry your own sausages without a lot of tools please give it a try. I didn’t add hot peppers for extra heat since the kids eat along. If you like a hot chorizo you need to add some to the recipe! This is a matter of taste and experimenting how it will turn out. In order to add a deep layer of smoke you need some low temperatures during the process. Aim for a temperature ranging from 75°C/170°F to 110°C/230°F maximum. The higher you go the faster the internal temperature will reach it’s limit and the less smoke you will taste in the end. 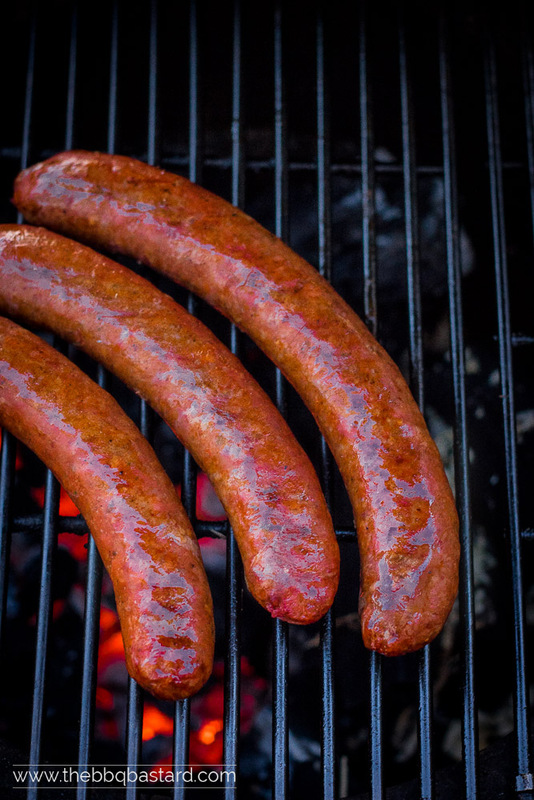 You can do this by cooking the sausages on indirect heat by dividing your coals (don’t add to much), using oklahoma style or bullet smoker or when using a kamado by using your platesetter. Close your lower vents but always keep the upper vents slightly open. If you don’t the smoke won’t be able to refresh and you’ll end up with a bitter tasting piece of meat. Since the maillard reaction is great on sausages too I ended up by shortly grilling them on a hot direct fire. That’s it for now! Hope you get some inspiration for your next barbecue session! If not take a look at the recipe index for more ideas! I Hope to hear about your experiences on Facebook. How pleased I am with the 1500 followers I gained last week (woop woop indeed) I would like to read more about your cooking adventures. Probably they will bring me more inspiration too. So take a moment and share the foodporn with all of us! And while talking about social media: Please share with your friends to support this blog. 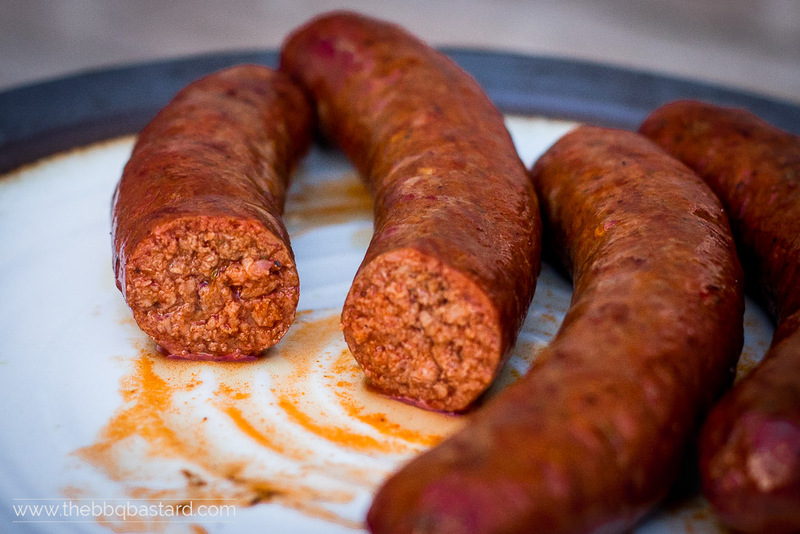 Delicious homemade chorizo sausage. Find out how to make and smoke them. Fans of cooking from scratch will enjoy making these delicious authentic hispanic sausages. Smoked Paprika: "La Chinata" or "Chiquilin"
20 gr smoked paprika powder I use "La Chinata" or "Chiquilin"
Start by cutting the "pork shoulder" and "pork back fat" in dices from about 2-3 cm. Mince your meat with a meat grinder. Use the large blade (8mm.). You need a coarse meat texture with some fat. I got this one for Christmas but I'm sure you can find other quality meat grinders too! Add the spices to the minced meat and mix thouroughly with the red wine. Put back in the fridge for a half hour. Put the spiced mince in the stuffer and turn on the machine at medium speed. Gradually lead the sausages but make sure you stuff them enough. It's a bit of a search to find the right tempo. You need the casings to be filled without air bubbles but they can't be to filled or they might explode. It worked pretty well of the first time. Maybe we had the luck to just do it right or it's not that hard as it sounds... Who will tell? Once the casings are stuffed with the meat you can form the sausages by twisting the homemade chorizo. Shift the direction you twist at each sausage end (to prevent them from unfolding again). Put the sausages in the fridge until you use them. You can freeze them too so make more than you need. Smoke the chorizo with oak wood (or apple) above indirect heat for about 2 hrs. at low temperature (90°C/200°F) until you reach an internal temperature of 65°C/150°F. - There's an affiliate link on the "Over worst", "Platesetter", "Bullet smoker", "Smoked Paprika", and "Sausage Kit"
These look so succulent! I’ve made standard sausages from scratch, but I MUST give this recipe a go! Chorizo is my favourite! Wow! So would like to taste your homemade chorizo, it must be a world apart from store-bought, YUM! Pinned and flipped! Thanks a lot Patty! It is really delicious (yet storebought over here is very decent too!) But we don’t find fresh chorizo here easily so it’s good to make some of your own! Plus I like to make it myself so I know how things are done! Thanks for stopping by and showing some share love! It’s well appreciated!